The story of Italy's Elegacy could be a case study in band development and tribulation. Begun better than a decade ago by Constantin Terzago (keyboards) and Massimo La Russa (guitars), they began with large expectations only to have them crushed after their first album, Impressions fumbled. Yet, the duo kept their dream alive, if only by continuing to write music. 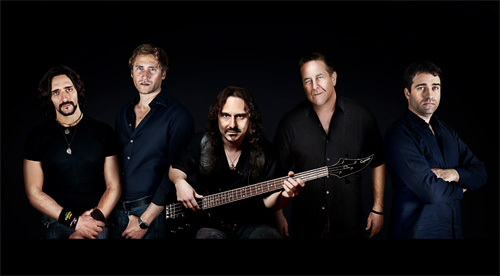 Then, several years ago, hope brightened with a chance meeting with drummer Mark Zonder (Fates Warning) and bass player Mike Lepond (Symphony X). Both took interest in the band's demo material and agreed to contribute their talent. Anothe boost came when fellow Turin native and Deridian vocalist Ivan Giannini joined the band. 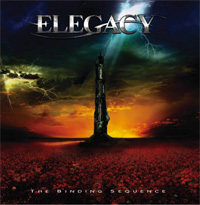 The result is Elegacy's second album, The Binding Sequence, a musical tome of progressive power metal. To begin, and not to be dismissive of their talent, both Zonder and Lepond are in fine form here. Having them on board is a major, steriod-like, shot in the arm for Elegacy's sound, not to mention Terzago and La Russa's enthusiasm after such struggles. Of more importance, both Zonder and Lepond had an ear for something both interesting and promising. Terzago and La Russa are adept at creating some enjoyable progressive metal. Obviously it revolves around both their respective instruments, so there's an abundance of playful keyboard and guitar solos throughout. Yet, they're skillful at developing a coherent song that takes their parts, adds others, binds them in proper sequence, and then wraps them up in groove and melody. One of the keys to that last element is undoubtly vocalist Giannini. A gifted singer, he has a natural melodic voice which, in turn, enhances and develops the inherent melody within any song, mostly driven by Terzago's keyboards, often piano. Putting these things together, and also recognizing some mild complexity, I think the Elegacy sense of melody, groove, and simple accessibility are what captured my attention. It's self-evident in songs like April Sun, The Dragon's Age, or The Other Me where melody weaves through moments of heaviness, speed, levity, and technicality with Gianni's voice leading the way. Perhaps the signature expression of their sound comes with The Impefect Miracle of Life where brisk motion and heaviness is bounded by some sweet interludes. One is about the midpoint with piano and Lepond's bass over some slight drums; another is the bass and playful jazz piano at the outro. Alternatively, for something less delicate, Elegacy can go straight to intensity as within the thick riff and rhythm section blister of When The Night Comes Down. At the end of the day, after years of both struggle and creativity yet without results, Elegacy's The Binding Sequence is a fine achievement for founders Constantin Terzago and Massimo La Russa, and a new source of hope and promise for the future. After years of both struggle and creativity yet without results, Elegacy's The Binding Sequence is a fine achievement for founders Constantin Terzago and Massimo La Russa, and a new source of hope and promise for the future.